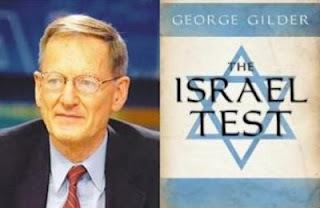 In his new book, "The Israel Test" (Richard Vigilante Books), George Gilder has written a superlative defense of capitalism and how it relates to Israel becoming the world's most advanced nation in the development of the new technologies, second only to the United States. Tiny Israel, barely the size of New Jersey, with a population of more than seven million, now has more brain power than all of Europe. While every ethnic group has its geniuses, the Jews have much more of them than any other group. According to Charles Murray, "The proportion of Jews with IQs of 140 or higher is somewhere around six times the proportion of everyone else." Indeed, Gilder writes: "The source of anti-Semitism is Jewish superiority and excellence. ... Hostility toward Jews stems not from any alleged legal violations or untoward violence but from their exceptional virtues." What infuriated Hitler most was the Jews' mastery of capitalism, their ability to build great department stores, newspapers, investment banks, publishing houses and many other great enterprises. Gilder bemoans the fact that Hitler's destruction of six million Jews deprived future Europe of the best brains and talents on the continent. And, ironically, it was Jewish scientific genius that helped the allies win World War II. We shall never know what great enterprises, what great works of genius the six million would have produced for the benefit of mankind. There is no telling how much wealth their talents would have created. Gilder is highly critical of the left's perverted and repugnant vision of how wealth is created by excellence-inspired capitalism: "With wealth seen as stolen from the exploited poor, the poor in turn win a license to dispossess and kill their oppressors and to disrupt capitalist economies. This is the foul message of Frantz Fanon, Hamas, al-Qaida, Hezbollah, and the academic coteries of Chomsky, Zinn, and a thousand Marxist myrmidons across the campuses of the world." To Gilder, "The Israel Test" forces us to decide which side we are on: independent, free Israel where genius can flourish and provide humanity with an endless array of beneficial inventions, or with jihadist Hamas, Hezbollah and the mullahs of Iran for whom destruction and murder are the primary purposes of life. "The choice remains clear," states Gilder, "between the ascent of capitalism and freedom and the economics of dependency and national socialism." "Regardless of flaws – and Israel has fewer flaws than perhaps any other nation – Israel is the pivot, the axis, the litmus, the trial. Are you for civilization or barbarism, life or death, wealth or envy? Are you an exponent of excellence and accomplishment or a leveling creed of troglodytic frenzy and hatred?" Israel recently passed Canada as the source of the most foreign companies on the NASDAQ index, launching far more high-tech companies per year than any country in Europe. And Gilder provides fascinating interviews of Israeli entrepreneurs and scientists who have made this economic miracle possible. Ironically, the early Jewish settlers in Palestine were utopian socialists who wanted to create perfect communism. They rejected all of the talents that made Jews some of the greatest capitalist entrepreneurs in Europe. And, of course, their utopia had to fail just like any other in history. But it wasn't until 1990 that Israel, under the leadership of market-oriented Benjamin Netanyahu, dismantled much of the socialist infrastructure and adopted a market economy. The result has been an economic miracle. Israel now creates many of the most powerful new technologies that go into personal computers, iPods, cell phones, medical breakthroughs and anti-missile defenses. In 2008, Israel produced 483 venture-backed companies with just over $2-billion invested. Germany produces annually about a hundred venture-backed companies. Germany, with very few Jews, is apparently no match for Israel's almost six million Jews. "The Israel Test" ought to be required reading for everyone in the United States government, including President Obama and his cabinet. Because of its financial conservatism, Israel has suffered far less in the global financial crisis than so many other countries, and its recovery will be faster than the rest of the global economy. Gilder's book clearly defines what's at stake in this dangerous world. In the apocalyptic struggle between capitalism and socialism, it clearly indicates why we must unequivocally pass "The Israel Test."